The Chinese phone maker Vivo has again unleashed on the Indian market a great product. 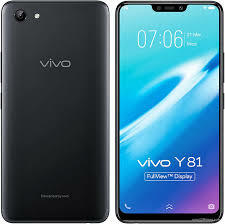 The Vivo Y81 was launched in June and is being sold from October 2018. This budget segment smartphone has several tricks up its sleeve. Do not be deceived by its low price since it can give most phones in premium segment a run for their money. It is available at CompareRaja at very cheap prices. Begin with the aluminum and plastic casing with sophisticated looking 19:9 aspect ratio 6.2 inch screen. The Vivo Y81 is available at CompareRaja and boasts of a vivid IPS LCD capacitive display that is unrivalled in its clarity. The Vivo display comes with a resolution of 720 x 1520 pixels. It packs in 270 pixels per inch to produce refined images that are a pleasure to see for hours. The front of this display is protected by Corning Gorilla Glass and you need have no fear of it being scratched by coins and keys while in your pocket. The body and the screen has a 88% ratio which has been possible due to wonderful innovative designing by Vivo engineers. Coming to the battery – the Vivo has a latest design lithium polymer 3260 mah battery producing enough juice to last several days. It powers a sturdy CPU which is an eight core Cortex A53. The CPU is supported by a PowerVR GE8320 GPU which develops clear picture in 16 million colors. Backing all this up is 4 GB RAM. This makes it run the Android 8.1 Oreo OS as smoothly as can be imagined. The internal memory is 32 GB and can store many hours of HD videos and thousands of photos. If that is not enough then it can be expanded to 256 GB using a dedicated micro SD slot. The phone connects to network using nano sim and 4G technology. Where possible it allows use of VoLTE. Two sim cards can be used and both slots support 4G. The dual sim provides dual standby facility. This impressive phone has an even more impressive camera. The 13 MP rear camera can shoot in HDR and panorama making every memory unforgettable. The AI allows you to take seflies using a 5 MP front shooter and creates superb images every time. It adjusts for age and skin tone by itself. There is a new feature called live shots. This allows you to take a 1.5 second long movie which is better than a still image. the live shot also records sound and is great for all those wonderful party moments. The phone has superb security. It allows one to use its fingerprint sensor or facial recognition. Vivo Y81 comes in black and gold variants which look stunning. No matter how you look at it the Vivo Y81 is a winner in every way.